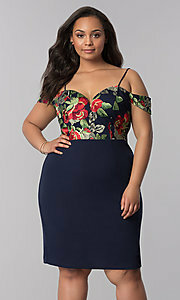 Flaunt your excellent fashion sense in this short plus-size party dress in navy blue. The intricately embroidered mesh on the princess-cut bodice grabs attention from every angle as the red and green floral patterns pop against the navy background. 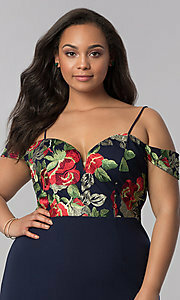 The off-the-shoulder plus party dress boasts a beautiful and figure-flattering sweetheart neckline and thin adjustable straps for a comfortable secure fit. 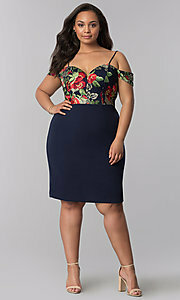 The short jersey skirt on this plus-size blue party dress features a soft jersey lining and skims the curves to accentuate a shapely silhouette. Ideal for celebrating at weddings, family celebrations, and so much more, this short navy party dress in plus sizes is a great addition to any fashionista's wardrobe.